The “I Love T-Shirts” pop-ups will be FREE for everyone to enter; venue capacity will be capped so best to arrive early. Fans will be able to hear songs from their fifth studio album “I Love Songs” before it is released as well as purchase limited edition merchandise and pre-order of the album. Each night Thundamentals will be putting on party – DJing with a line-up of special guests. 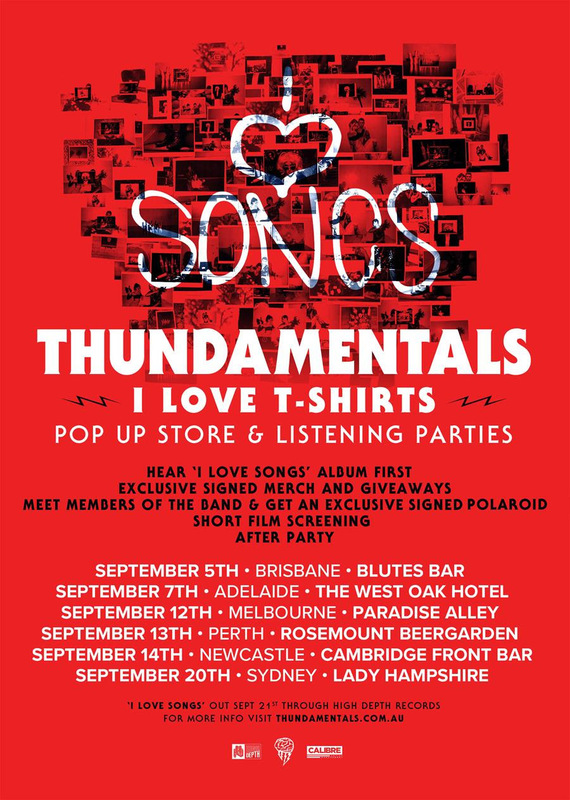 “I Love T-Shirts” will launch Thundamentals self-produced album “I Love Songs” which features the single I Miss You and album track All I See Is Music. Recorded at their own studio in Sydney’s inner suburbs, the 12-track release is an intensely personal listen. Fans of the group will be familiar with their frequent political commentary, but amongst an increasingly turbulent society, they have decided to focus their album on what’s been lost amongst the chaos: Love. As a result, I Love Songs focuses on love in its varying forms, and showing Thundamentals’ undeniable writing ability in a more intimate light. 2018 also marks a ‘Decade of the Thundakat’, and with 10 years under their belts Thundamentals will embark on their album tour in November with tickets onsale now.